An incredible website drives business, promotes growth, and facilitates continued customer interaction. It is the one part of marketing that cannot be avoided due to the vital nature of a functional and well-designed website. The problem is that traditional website design is a nightmare. It’s laden with delays, hidden costs, and tends to produce less-than-optimal results. It can be so slow that you may need to start a traditional website redesign in the third quarter of the year to have it ready in the first quarter of next year. During the three months that you engage in traditional website redesign, your website may be inadequate and your marketing activity may grind to a halt. You may lose customers, other businesses may encroach upon your territory, and you may find that your redesign that started three months ago is inadequate for the world when it does get published. This lengthy process is unacceptable for the modern business. Interrupting your normal activities is like closing your business’s doors for months. Not even the richest marketers could afford to do that. Let’s take a look at growth-driven design, which is an alternative approach to traditional website redesign, to learn how you can still have an amazing website without having to close your website’s doors for months. Before delivering into what growth-driven design entails, it’s imperative that you understand the challenges of web design, and the risk associated with traditional web design. No matter what approach to web design that you choose, some parts of the process will remain the same. A good web design firm will start by assessing what you currently have before working with you, to design a strategy as to where your website should go. The problem with traditional web design is that you’re essentially launching your site over and over on a cycle that lasts about 1.5 to 2 years. Add in the 3 months required for a traditional web design, and you can quickly see how your new website could become lackluster and rusty in only a few months after undergoing a redesign. A large up-front cost for a redesign that may prove to be ineffective. Three to four months focused on nothing but redesigning your website, while your marketing is halted. No guarantee that your redesigned website will perform, nor any metrics with which to tweak it during the design process. A susceptibility for your redesign to go over any defined budgets, outside your scope of marketing focus and to be far later to your marketing party than it should be. No more major updates until your next costly and time-intensive redesign. Clashes with developing technologies such as smartphones and other mobile devices. 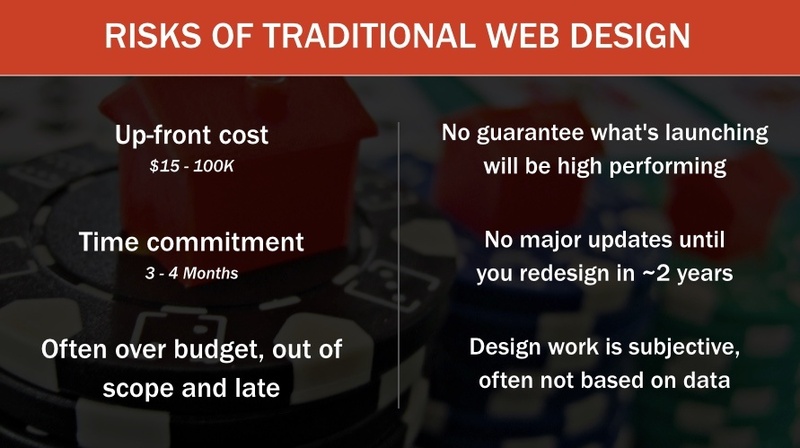 This can make a traditional website redesign extremely costly. Some businesses may take more than the average 1.5 to 2 years per redesign cycle due to the costs involved with it, which in turn causes them to lag behind the competition. Growth-driven design is web design that allows your website to grow alongside your business. It focuses on a continual improvement on the design and inner workings of your website, which in turn significantly shortens the design process. This shorter design process results in a more agile design that has hard numbers backing it. This minimizes the drawbacks of traditional web redesigns while bringing some unique advantages to the table. The way growth-driven design shortens the design process is by continuously working to improve your website. Smaller steps gradually contribute to a grander overall result, which in turn allows for improvements to be made over time. These smaller steps allow for an adaptive web design process. You can focus on the elements that your visitors enjoy the most, which in turn allows you to eliminate the guesswork involved with finding an effective web design. The best part, however, is the fact that your current customers retain a sense of familiarity with your website. This allows you to tweak your entire marketing process on-the-fly, which in turn means that you can continue operating your business confidently while redesigning your website to be more effective. Growth-driven design can be separated into two phases. Each one shares similarities with traditional web design, but it’s important to understand how growth-driven design works differently from traditional web design. Let’s examine both of those phases below. The initial phase involves assessing what your website does, creating a strategy, envisioning a rough picture of your goal, then working towards that goal. You’ll incorporate analytics and perform other necessary steps to ensure that your growth-driven design accomplishes what you want. The following steps can be considered preliminary. They will help you to better understand what drives your users, which in turn enables you to create a stronger strategy to drive the design of your website. Creating a Strategy – Do you want more visitors? Do you want to focus on increasing your conversion rates? Is your goal to increase your marketing via content creation or pay-per-click ads? This is the part where these questions should be answered. Auditing Your Website – Your existing website will serve as the foundation for what growth-driven design will create. Any existing analytics, information, content and designs will be evaluated to determine what works. Understanding User Interaction – The next part of your assessment will require understanding how your users interact with your website. The pages they land on, the pages they navigate to, and the pages they view before leaving will be interpreted along with how they interact with your website. Envisioning Your Users’ Desires – The last part concerning your users involves understanding what they want. You will ascertain their goals and desires to make the next step in the design process more effective. The next step in the first phase of a growth-driven design is to create a rough design for your website. This will be a functional design that incorporates only the core components of your website, which in turn will ensure that you can continue to facilitate business and acquire a better understanding of your visitors during the proceeding steps. Creating Your Initial Design – You can consider your initial design a diamond in the rough without any extra precious metals to line it. It will only be functional enough to allow your users to use your website while excluding the nice-to-haves and extra features you may currently have or desire. Creating a Wish List – Features you desire for your website should be discussed. These will act much like finishing touches, which makes them optional for part of the design process but vital for the finished product. Focusing on a Simple UX Design – From this step forwards, the majority of phase one of growth-driven design mirrors that of a traditional web design. You will focus on creating a simplified user experience. Organizing Content and Site Structure – Your content will be assembled, and the way content interlinks will be examined. Edits to your linking structure may be made during this step to create a solid foundation for your future website. Understanding the Big Picture of Your Design – Your desired goals of your website redesign will be examined. How your rough design complements these goals should be addressed to ensure your layout is successful. Configuring Analytics – Any software designed to monitor how your visitors interact with your website should be configured during this step. This can include the integration of e-commerce information with your web analytics. The one thing to keep in mind during this is that phase one is designed to be a foundation. You shouldn’t sweat the small stuff, as this will allow you to create a strong foundation that will enable the refining that occurs during the next phase. Where phase one of growth-driven design establishes a foundation for your website, phase two focuses on creating marked improvements. This is where growth-driven design differs the most from traditional web design elements. 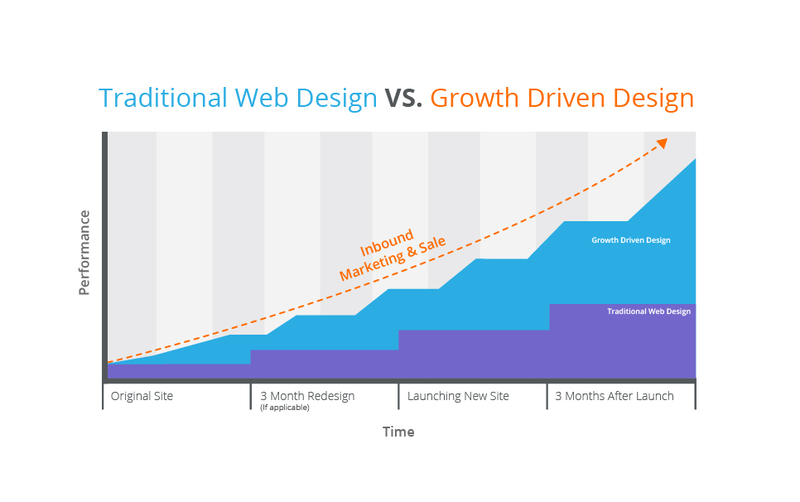 The largest difference between phase two of growth-driven design and traditional design is that your website is not a set-and-forget project. Gradual and continual improvements will be made to your website until it is a shining, polished and finished product. Making Improvements Based on User Interaction – Every point of data from your analytics will be used to interpret how to best serve your users. Tweaks to designs, changes to link structures and other accommodations will occur. Testing Action Hypotheses – Action items, such as “Buy Now” or banner elements, will be implemented. They will be tested to see how effective they are. If they don’t work, then they should be removed to make way for elements that do produce results. Tracking User Interactions and Feedback – Your analytics should include elements that help you record how users interact with your page. This can include everything from tracking the mouse movements of your visitors to asking them directly for their input in the form of surveys. Creating New Tasks Based on Feedback – The feedback you acquire from your users will be used to create new tasks for your web design. This can include creating new elements, reshaping others, or adding features designed to enhance the effectiveness of your website, with regards to the strategy and goals you developed in phase one. Measuring Progress – Predetermined success metrics will allow you to evaluate if the changes to your website are successful ones. These will constantly need to be monitored to ensure that your evolving web design fulfills the needs of your business and your customers. Implementing Changes – Growth-driven web design requires the continuous implementation of changes. You should test new elements, integrate new technologies, and continue to respond to the desires of your users. Implementing these changes is a vital part of arriving at a successful design. Working on Wish List Items – Those small features considered extras on your wish list should slowly be implemented. They should then go through the same rigorous statistics-based testing to ensure that these items are worthwhile to your business. Checking for Improvements – You should continually assess the needs of your users while comparing them to your results. This will allow you to modify your site under growth-driven design repeatedly until your website has become a sales machine. One thing to note that differentiates phase one from phase two in growth-driven design is the fact that the steps of phase two can occur in almost any order. They may occur repeatedly with small loops. This happens because you’re constantly refining your website. You want to build the leanest, meanest sales machine of a website by focusing on little changes. This allows you to continue marketing the digital side of your business while creating a website that drives sales. Growth-driven design works gradually rather than by creating a complete product that may not work. Your website starts with a rough shape that becomes refined over the course of months to years until it perfectly matches the needs of your business and your customers. This evolution of a growth-driven design incorporates statistics, trial and error, and many other elements designed to evolve your website to make it the top predator in your business environment. You’ll see more sales and success with your website in a more timely manner than you would with traditional web design while avoiding many of its drawbacks. When you’re ready to redesign your website, forget about trying to construct something from nothing. Start with something that works before refining it into something that produces customers and sales while being shaped to become a money-making machine. Growth-driven design breaks away from the stagnant and cumbersome nature of traditional web design. Choose growth-driven web design to see just how successful your website can become.